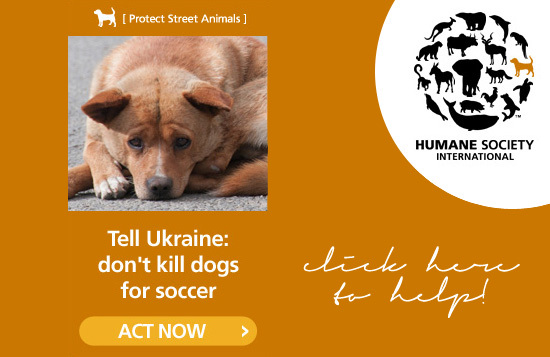 In an effort to “rid the streets of [stray dogs] in time for the Euro 2012 soccer championships” in Ukraine, dogs are being poisoned to death. “Meat laced with poison is being left out for the animals to consume, resulting in their prolonged and agonizing deaths.” There have even been reports of dogs being burned alive in incinerators. This is horrific and must be stopped. The Humane Society International along with other animal protection organizations in Ukraine have contacted authorities and expressed their distress and objections with no response. My brother just yesterday informed me of this and I’m usually aware of issues like this as soon as they arise. Apparently this has been going on for some time now. More people need to know about this and help put an end to it. Please sign this petition and share this information with others. Feel free to edit the letter in whatever (polite) way you’d like. Tell Ukraine that you’ll boycott the Euro 2012 soccer championships if they don’t stop this immediately. These dogs need our help. So many have already been killed and we can’t do anything about that now, but we can at least help those that are left. Thank you!